The 1950s and ’60s found Capitol Records with a bright roster of recording artists who specialized in pop classics — and in the course of their careers, many of them took a crack at a Cole Porter song or two. 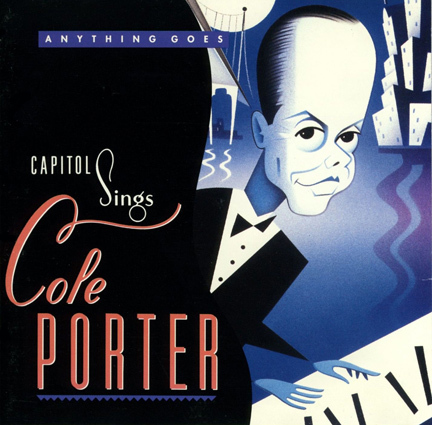 This compilation, “Capitol Sings Cole Porter,” is the result. The sound quality is superior and the artwork is as well. This is an excellent album. “Blow, Gabriel, Blow” gets the royal treatment from one of our very favorite songbirds, the great (but strangely overlooked) Martha Tilton. She isn't remembered as she should be, but just one listen proves that she could sing alongside the best of them. One unexpected treat is the Louis Prima and Keely Smith awesome duet on “I’ve Got You Under My Skin.” Together they were an unstoppable pair, and this song tells you why. Even the great Nat King Cole outdoes himself as he sings so sweetly that it was “Just One Of Those Thongs.” His voice is rich, masculine and full of warmth. Incidentally, the famed cylinder-shaped office building in Hollywood that headquartered Capitol Records in those days was known as “the house that Nat built” because indeed the money this successful recording artist brought to the label greatly enriched the company. Margaret Whiting was very big in her day, and does a wonderful job with “Why Shouldn't I?” — a fine ballad. In the same vein, Helen O’Connell was a gifted vocalist, though her style is somewhat at odds with the formal “In The Still Of the Night” presented here — a song specifically written with a male vocalist in mind. But without a doubt the highlight of this album is Nancy Wilson's sensational “You'd Be So Nice To Come Home To.” This track alone is worth the price of the CD! We saw Nancy during a live taping of “The Tonight Show with Johnny Carson” years ago in New York, and she was every bit as good in person as she sounds on this studio track. Playing this CD might inspire you to host a 1960-ish suburban cocktail party. So stock up on the Jack Daniels and Tangarey and send out the invitations!